Solving Debt and Tax Problems Since 1996. Don Bell Law is dedicated to: Assisting you decide if you need Bankruptcy , and helping you take care of your IRS Problem. Don Bell, a Grand Junction bankruptcy attorney with the debt relief agency Don Bell Law, is a master at what he does. He is highly recommended due to his extensive knowledge of bankruptcy and also because he provides very compassionate and encouraging counsel. On top of that, he strives to be affordable so that he can help those who really need it. Don truly cares about each of his clients. Time and time again, they rave about how comfortable he made them feel and how smoothly the process went for them. He always makes a point to be honest and realistic with his clients, and he takes the time necessary to help his clients to fully understand all aspects of the bankruptcy process. He always makes sure that individuals are well guided and prepared for their hearing. Don provides incredible service to his clients. He will meet them after work and on weekends, he always responds promptly to emails and phone calls, and he basically just does what he can to make this legal process as painless possible. With him by your side, you can rest assured that you are in the good hands of a truly caring person that absolutely knows how to help you with your bankruptcy and IRS issues. 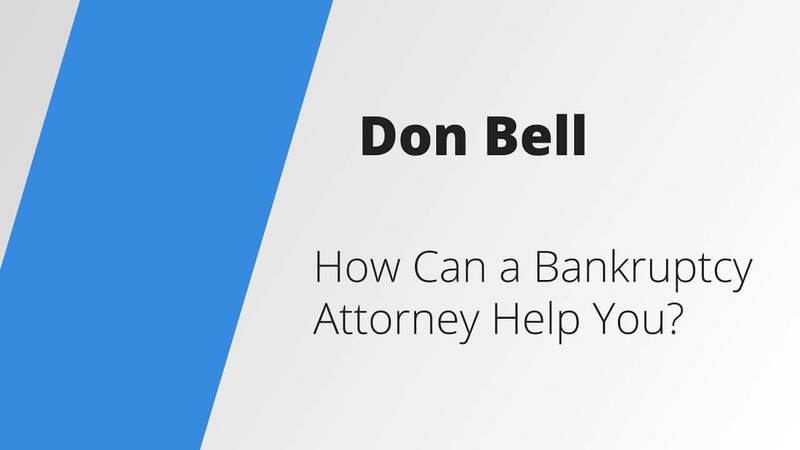 Don Bell represented me in my bankruptcy. He was professional, courteous and fair. I was treated with respect and dignity during one of the hardest times of my life. I would highly recommend Don to anyone seeking an honest Attorney. Don is a very empathetic attorney that people will feel comfortable going in and speaking to him about their finances, not be embarrassed about it.